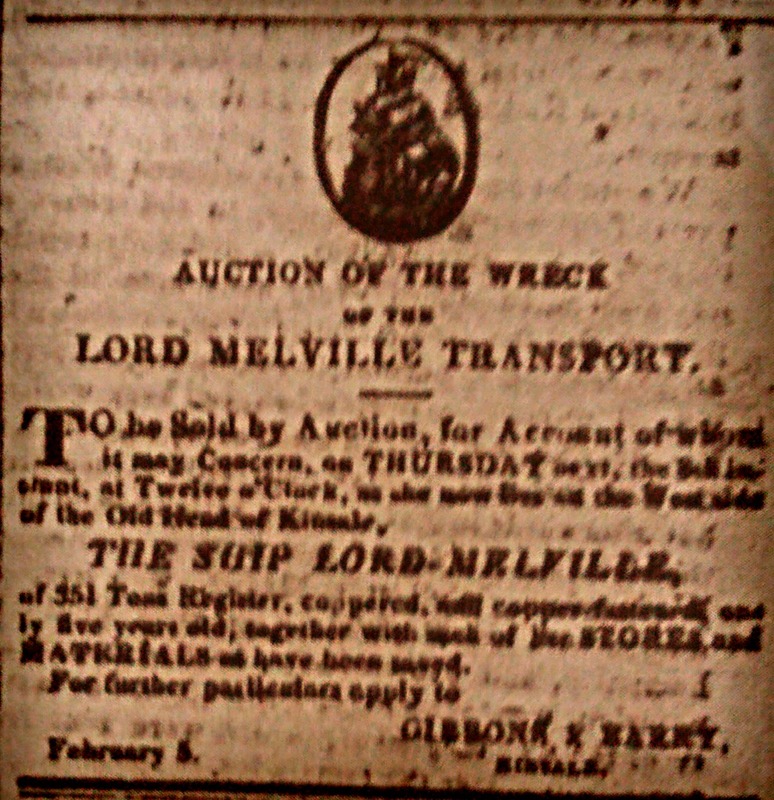 The Wrecks of the Sea Horse, Boadicea and Lord Melville Transports: Waterford Mirror, 3 February 1816. Within memory, so melancholy a shipwreck had not happened on this coast as which occurred on Tuesday at Tramore. 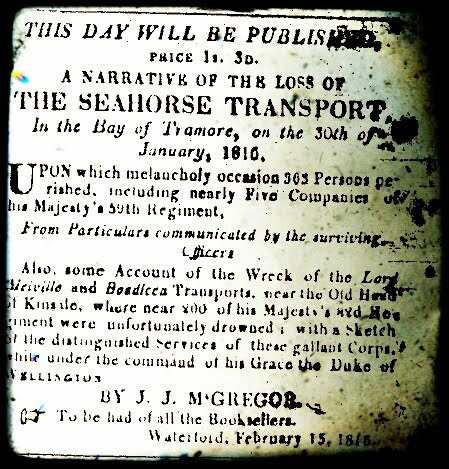 The Seahorse Transport, James Gibbs, Master, a ship of 350 tons, from Ramsgate for Cork, with a large part of the 59th Regiment on board, found herself on this morning locked between the heads of Tramore Bay, the wind blowing strong from S. S. E.. Her mizzen mast was swept away, and she worked hard to weather Brownstown Head, with a view of making the harbour. In vain; about one o’clock nearly at low water, when assistance was particularly impractical, she struck nearly at the middle of that extensive strand, and in a few minutes, went to pieces. From that moment, Tramore Strand, the delight of summer visitors, presented a calamitous picture of mortality. Notwithstanding the humanity and activity of John Walsh Esq, Coast Surveyor, of Michael Kennedy, Esq, agent to the Underwriters, and of several others, few comparatively have been saved of the great number that were on board. The crew consisted, we believe, of the Captain, the mate, and fourteen hands; of these, the captain and two seamen have been saved. Of the 59th Regiment, we understand that the Seahorse contained 16 Officers, 297 non-commissioned officers and privates, with about 30 women and 40 children. We fear that scarcely more than four Officers, one Sergeant, one drummer, and nineteen privates have been saved. Several bodies have been washed ashore, and buried at Drumcannon. We believe the following is an accurate list of the Officers lost and saved: - SAVED: Lieuts. Cowper, McPhearson, and Hartford; Ensign Seward. LOST:- Major Douglas; Capt. McGregor; Surgeon Hagan; Assistant Surgeon Lambe; Lieutenants Dent, (Adjutant), Veale, Geddies, Scott, and Gillespie; Ensigns Ross, and Hill; Quarter Master Baird; and Mr Allen, of the Navy (Purser). Another instance of shipwreck, but far less disastrous, occurred upon Tramore Strand, on Wednesday, near the bathing place. About noon the brig, Apollonia, of Caernarvon, J. Parry, Master, bound from London to Cork with a general cargo, was stranded, and in a short time, went to pieces- crew saved. A great part of the vessel saved, and more expected, but all in rather a perishable condition. On Wednesday night, another brig was embayed here, but had the good fortune to weather the heads. Yesterday presented a melancholy sight near this- a transport had been seen for a considerable time approaching the harbour, and at length having crossed it to anchor near the shore within the opposite land, her distressed and dangerous situation being evident, crowds gathered from Tramore and the adjoining country on the beach. After a short period, her anchors having dragged, she drifted to the beach and having struck in a tremendous surf- unspeakable horror soon followed. The ship been soon broken by the dreadful waves that assailed her, the shore became scattered with dead bodies, a few struggling survivors, planks, cordage and every species of wreck. Much exertion was made by several spirited individuals, but particularly by Mr Hunt of Tramore, who was instrumental in saving many. The severity of the day and the disadvantage of an ebb instead of a flood tide added greatly to the calamity. Benumbed with cold and overwhelmed by criminal waves, the poor sufferers, fell speedy victims to their deplorable fate; a great number of women and children were on board- not one escaped. About half the 59th Regiment had embarked in this transport at Deal, their number three hundred and upwards and of them sixteen were Officers. About 25 (including four officers) have been saved. The Regiment was coming from France, and had shared in the glories of Waterloo. Brave men, companions in arms, and dear friends stood on the deck-looked at each other- each expected his own fate and hoped for his friend’s safety- wave after wave thundered. Major Douglas, Captains, Lieutenants, whose names I have not yet learned, were swept away, never to meet their friends and social home, never to battle another time, the vain spirit of France. Women embraced their husbands, bade them farewell and died calmly. Their heroism softened the pangs of men who saw- whose brave hearts bled and could not relieve them! Children took leave of their parents, and rising above the weakness of their age wept not. The Quarter Master’s Lady behaved with great firmness- remained with her children in the cabin- said to an Officer “It is the will of Heaven,” and was seen no more. The wife of a private said “Will you die with me and your child? But you may escape and this may be of use,” and gave him her pocket with a sum of money and she took out her earrings and put them in it. Her self and child were lost. The survivor, more wretched than they, lives to tell the tale, as tears mask his manly face. The Captain of the Transport was saved; the mate fell from the mast early in the day, and was nearly killed and quite disabled. This probably occasioned the deplorable loss as he was well acquainted with the coast. Lieut. Allen, a young officer of the navy, and of great merit, (coming to Ireland), directed the ship for some time with boldness and skill; he too was swept away. Above 350 persons have perished. A great quantity of valuable things is lost, and the vessel shattered into 1000 fragments, strews two or three miles of the coast. 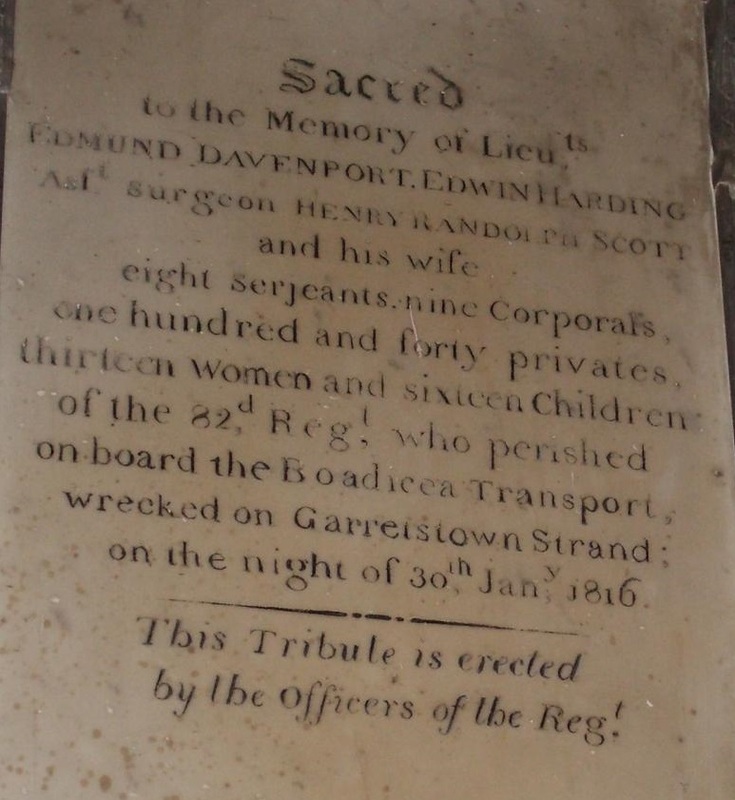 Lieuts MacPhearson, Hartford and Cowper and Ensign Seward, survive of the Officers, all much bruised and ill, but Mr Cowper the most severely; he now lies extremely ill at Tramore. The night of the calamity a cottager and his wife, near the fatal spot, showed every tenderness to the miserable victims. But for their humble and lonely dwelling, so many had not now lived to tell this tale. To the honour of Irish character they gave their only bed to two wounded and benumbed Officers, and lodged and comforted all the privates that were too ill to move during the night. Some reward is surely due from persons in authority to this conduct. The man’s name is Dunn. Dead bodies are now hourly throwing in. The brig which was wrecked here last night was the Apollonia, of Caernarvon, John Parry, Master, from London for Cork, with a general cargo of teas,liops, &c. &c. The vessel has gone to pieces, and the crew (seven in number), were fortunately saved by the extraordinary exertions at the risk of their lives, of the Gentlemen at foot mentioned. 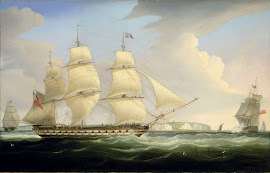 Cornelius henry Bolton, Samuel Davis, Edward Courtenay, William M Ardagh, Richard Sargent, Matthew Turner, Esqrs., Rev Mr Frazer, &c, &c, &c.
Collector Wallace was on the spot and gave every assistance; he acted with the greatest humanity towards the unfortunate captain and crew. On Tuesday evening last, two vessels were observed to be embayed between the Old Head of Kinsale and the Seven Heads, the wind blowing a gale from the S. E. they used every exertion and adopted every expedient, to weather the old Head, in vain; the peril of their situation increased every moment, and, towards evening, an account was brought to Kinsale, that the ship would, in a short time, be on shore, and that the brig had dropped her anchors, in the hope of riding out the gale. On the receipt of this distressing communication, Collector Meade, with a decision and promptness equally creditable to him as a public officer and a man of humanity, ordered an Officer’s party of the Limerick Militia, under the direction of Mr. Pratt, the Port Surveyor, to the Old Head, to afford every assistance and protection in their power to those unfortunate vessels. Mr. Spifler Newman, a respectable Gentleman of Kinsale, who holds a Revenue situation, generously volunteered his services, notwithstanding that he laboured under indisposition and, although the scene of the apprehended calamity was altogether out of his district, and the range of his official duty, he obeyed the call of humanity, and accompanied Mr. Pratt and the military to the Old head. They had to cross the Ferry of Kinsale, and then march 5 or 6 miles through bye roads, to get to their destination, when they arrived there, they found that the ship had been driven ashore among the rocks- that, shortly after she struck, her boat had been launched and manned with five men- that two Officers and two Ladies, supposed to be their wives, an Assistant Surgeon, a Sergeant, his wife and child, had got into her, in the hope of gaining the shore- that, in a few minutes, she was struck by a wave and swamped; and, melancholy to relate, every soul perished, with the exception of one of the seamen, who reached the land scarcely alive. In a short time, the body of one of the Ladies was washed on shore, and although her name was sufficiently indicated by some papers found in her pockets, we forbear to mention it for the present, from obvious motives of caution, and the possibility of mistake. All the rest of the people of the ship remained in her; at low water, in the course of the night, she was left nearly dry; and at about one or two o’clock they succeeded, under Divine providence in getting safely to land, to the number of about 400 souls. The ship was we understand a Transport, called the Lord Melville, with a detachment of the 59th and 62th Regts on board, bound for Cork. At the commencement of the night, the brig being at anchor, and farther off shore, had to all appearance much greater chance of escape than the ship.- she was distinctly seen by the Revenue officers and military party, with a light at her top mast till after midnight. The light and vessel then disappeared altogether. It still blew a tremendous gale of wind right on the shore, the sea ran mountains high, the rain poured down in torrents, and the night was pitch dark. Under these circumstances, the most gloomy apprehensions for the fate of the brig were entertained by the party from Kinsale. When the morning dawned, these apprehensions seemed but too well grounded, as the brig had disappeared altogether. However, after a diligent search for some time along the shore, the fragments of her were discovered among the rocks, which lie between the two strands of Garrett’s Town, and where she had been driven after parting her anchors in the night. Upon approaching the wreck, a most heartrending scene of misery, desolation and death, presented itself to the view. The vessel seemed to be a confused mass of timber, planks and boards, broken to pieces, and intermixed with piles of dead bodies, men, women, and children! Near to the wreck was situated a rock, somewhat elevated above the surface of the water, and upon this were seen about eighty or ninety poor human creature who had scrambled to it from the vessel, and were still alive. The people from the shore communicated to them as well as they could, that their only chance of safety was in remaining where they were until low water; but, either through impatience of the misery of their situation, or from the impulse of despair, near 30 of them plunged into the sea, and endeavoured to gain the shore, but in vain, as most of them perished in the attempt. About 50 remained on the rock until low water, and were all saved. We have not yet been able to learn the name of the brig; she was a transport, and had a detachment of the 82nd on board, bound for Cork. We have had different accounts of the number of the detachment; the Kinsale accounts make it very considerable, and other accounts, which deserve some consideration, being from persons connected with the regiment, making it much less.- For the present, while there is a possibility of mistake, we shall abstain from mentioning the particulars of either estimate. Suffice to say, that only fifty or sixty escaped from the brig. We have heard the name of one of the Officers of the 82nd who was saved- we announce it with great pleasure, for the relief of his family and friends, Lieut. Starkey. Yesterday morning the Sovereign of Kinsale Governor Browne and Collector Meade were most actively employed in procuring clothing provisions and medical assistance for the poor surviving sufferers. As soon as they made the necessary arrangements, they repaired in person to the wrecks, and from the cordial co-operation which they received from the inhabitants of the town, of all ranks and description, they have no doubt been enabled to afford the most timely and effectual relief. The brig has gone to pieces, and it was imagined, that the ship would share the same fate in the course of last night. Waterford Mirror 3 February 1816.